Beloved, let us love one another, because love is of God; everyone who loves is begotten by God and knows God. Whoever is without love does not know God, for God is love. In this way the love of God was revealed to us: God sent his only Son into the world so that we might have life through him. In this is love: not that we have loved God, but that he loved us and sent his Son as expiation for our sins. We are a busy Church today. As we observe the Sixth Sunday of Easter we also observe the 64th Anniversary of the Martyrdom of Joseph Padewski and Mother’s Day. It may seem to be a difficult challenge. We have to, as a Church, concentrate on Easter. That is our first duty, to proclaim Jesus’ salvation and the promise of His resurrection to the whole world. How do you mix that with the fact that members of the Church are sometimes called to suffer and even die to proclaim this message – something happening right now in the Middle East, Asia, and Africa. Then couple all that with honoring our Blessed Mother and our moms in a special way. Certainly, each of these events can stand alone and with deep significance for the Christian faithful. Thankfully, our Lord has already showed us how all this is bound together: This is my commandment: love one another as I love you. No one has greater love than this, to lay down one’s life for one’s friends. Bishop Padewski lived his vocation and followed in Jesus’ footsteps. He returned to Poland from Albany to serve God’s people in the devastation following World War II. He did not consider his own safety or comfort, but rather followed the commandment of love and walked into the horrors of the communist takeover of Poland. He was arrested, tortured, and killed for his love of God’s people and his faithfulness to Jesus. The Blessed Virgin is the exemplar of love for Jesus. We not only honor her as our heavenly mother, but also as our example of love and dedication to her Son, Jesus. She sacrificed her heart and life for Him. So too our mothers, the first example of love in our lives. They laid down their lives in a great act of sacrificial love. All of these themes, all of Christianity, is joined together by love – love of God and for each other – giving all we are for the truth of love. 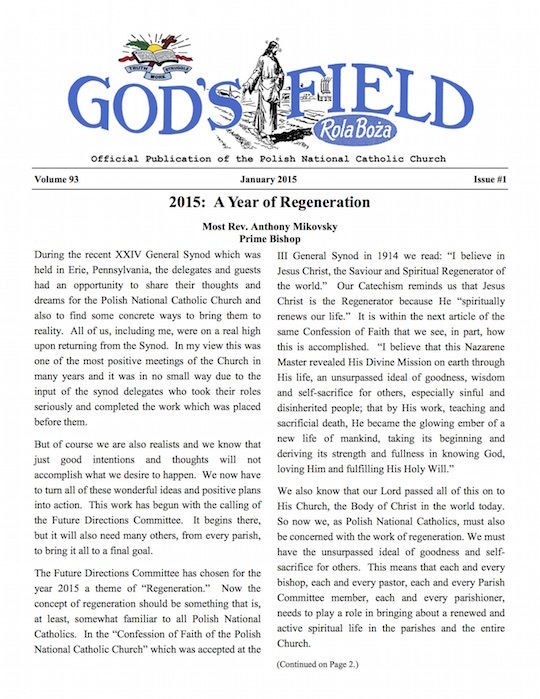 The latest issue of God’s Field is now available online. This edition features reports on our Year of Regeneration, a Biblical Financial Planning Workshop with Dr. Jim Ploskonka (live and on-line), the history of our Church’s martyr, Bishop Joseph Padewski, and of course the National United Choirs Music Scholarship program. Information on other upcoming programs including the national Mission & Evangelism Workshop are also included. Let us pray for the Christians of and in Iraq. They are our brothers and sisters in Christ, members of the body of Christ, our family. Lord God, Father Almighty, grant by Your strong arm that Your Church in Iraq may be saved and preserved from every evil. Grant also that it may remain steadfast and persevere in faith before the evils of the enemy. If called to martyrdom, may Your Church show forth strong witness; for You preserve our lives even if we lose them in the eyes of the world. May we too be strengthened to serve you in imitation of the courage of the Holy Martyrs of Iraq. We ask this through Jesus Christ, Your Son, who lives and reigns with You in the unity of the Holy Spirit, forever and ever. Amen. O God, Who rules the world from everlasting to everlasting; speak to our hearts when courage fails, and we faint for fear. Keep us resolute and steadfast in the things that cannot be shaken, abounding in hope and knowing that our labor is not in vain in Thee. Restore our faith in Thine eternal purpose: renew in us that love which never fails; and make us lift up our eyes to behold, beyond the things which are seen and temporal, the things which are unseen and eternal. We ask in the Name of Jesus Christ our Lord. Amen. Today we observe the Solemnity of the Transfiguration of our Lord. We read in the 17th chapter of the Gospel according to St. Matthew: Jesus took Peter, James, and his brother, John, and led them up a high mountain by themselves. And he was transfigured before them; his face shone like the sun and his clothes became white as light. And behold, Moses and Elijah appeared to them, conversing with him. Today, March 25th, is the Solemnity of the Annunciation of the B.V.M. On this day let us remember that God always offers us a choice. In order to carry out His plan for humanity’s salvation He needed the cooperation of the Blessed Virgin. The angel came to her and presented God’s plan to her. She was not forced or coerced into saying yes to God’s plan. In fact, her life would become more difficult if she said yes. Still, she did say yes to God. God constantly asks of us. He calls us to follow Him, to live in His way. It isn’t always easy, yet God gives us the grace we need to follow Him loyally. Pray this week for Mary’s intercession so that we may receive the grace to say yes to whatever God asks of us. Solemnity of St. Joseph, Spouse of the B.V.M. Did you know that our parish was originally founded as the parish of St. Joseph? Today is the Solemnity of St. Joseph, Husband of the B.V.M. As we reflect, let us recall Joseph, the silent man of the Gospels, part of the line of great men of faith. He is described as a “just man”, a righteous man of integrity. For centuries his place in the story of Jesus was comparatively unnoticed. Gradually, the Holy Church recognized him as patron of fathers, of families, of manual workers, especially carpenters, and of all who desire a holy death. St. Joseph, pray for us and our parish. We commemorate Bishop Joseph Padewski, who served our Holy Polish National Catholic Church in the United States, including locally in Albany, and in Poland this Thursday, May 10th. On September 1, 1939 Nazi Germany invaded Poland from the west and the Soviet Union invaded from the east. The losses to Poland and to the Church in Poland during the Nazi German and Soviet occupation were devastating. Over 6 million Poles died including 3 million Polish citizens of the Jewish faith. Many priests were sent to concentration camps. In all, 28% of PNCC priests were killed. The Nazis arrested Bishop Padewski, who shepherded the PNCC in Poland, in 1942. Many of the priests and leaders of our Church already imprisoned or sent to concentration camps. After 18 months, through the intervention of the Red Cross, he was freed and returned to the United States. After the war he returned to Poland resuming his duties as Bishop of the Polish branch of the PNCC. Shortly after his return, the Soviet Union completed its takeover of Poland and asserted Communist control. In this atmosphere of Stalinist terror, Bishop Padewski was arrested by the Communist Secret Police (UB) in Warsaw and was held at their prison on Rakowieckiej Street. Bishop Padewski died on May 10, 1951 as a result of Secret Police questioning and maltreatment. Bishop Joseph, pastor and shepherd of our Holy Church, and martyr for the faith, pray for us.